LiveU to showcase encoder for hybrid DSNG 4K trucks in Beijing, China. Hackensack, NJ, August 2016: [Source: LiveU] LiveU will showcase its next-generation LU710 4K/p60 HEVC rack-mountable 1U encoder for superior video performance at the Beijing International Radio, TV and Film Exhibition 2016 (Stand 8A36). The LU710 meets market demands for higher resolution and more efficient transmission protocols, supporting video encoding for 4K resolution and new H.265/HEVC standards. The LU710 encoder will support Sony Professional Solution China’s upgraded 4K wireless transmission ODS* (Other Digital Stuff) content and hybrid DSNG 4K truck, as part of the ongoing collaboration between Sony, LiveU and LiveU’s local partner, Diadem, announced last year. Combining the Xtender transmission device (LiveU’s external antenna with six modems, delivering video rates of up to 40 Mbps) with LiveU’s LU710 4K/HEVC encoder will transform any SNG truck into a fully mobile hybrid cellular/satellite solution for transmitting 4K/HD video with improved efficiency and resiliency. The new LU710 4K/HEVC encoder integrates LiveU’s field-proven bonding technology, 10 industry patents, and integral LRT™ (LiveU Reliable Transport™) protocol for optimised video performance using integral adaptive bit rate and forward error correction technology. LRT™ enables reliable, low delay live video streaming over non-guaranteed IP networks. The new encoder supports live transmission and store and forward modes and can be connected to an external touch screen for onsite control. It also supports SDI/HDMI video input and allows bonding over two internet ports. 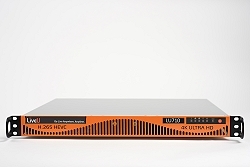 In addition to hybrid trucks, the encoder can also be used for streaming video between two stations, instead of costly fibre connections, with high-quality, reliable streaming capability.